Williams test driver Susie Wolff and Sauber's Felipe Nasr have collided at the second pre-season test, while Lewis Hamilton has withdrawn due to illness. Details of the crash are unclear, but it seems Nasr hit the back of Wolff's car on the entry to Turn Five at Barcelona's Circuit de Catalunya. 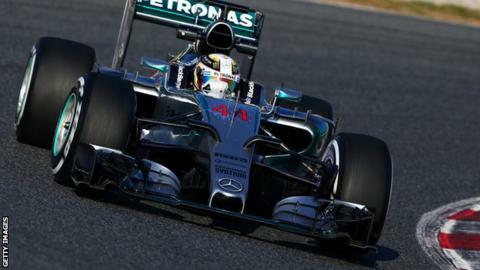 On Hamilton, a Mercedes spokesman said he had a "high fever" in the morning and "didn't feel comfortable." The 30-year-old world champion stopped after completing just 11 laps. Mercedes reserve driver Pascal Wehrlein replaced Hamilton as the Briton's team-mate Nico Rosberg is nursing a sore nerve in his neck, which doctors have told him to rest. Rosberg is scheduled to drive the car on Friday, but his participation is in doubt because of his condition. Mercedes initially said they chose Wehrlein rather than Hamilton's team-mate Nico Rosberg because they had a heavy programme and that if Hamilton did not recover it would be unrealistic to expect one driver to do all four days of the test. However, the team has now confirmed that Rosberg has inflamed a nerve in his neck which needs resting and his own participation on Friday is also in doubt. Hamilton had been fifth fastest up to that point as the teams continue their preparations for the start of the season in Melbourne, Australia, next month. Sauber's Brazilian rookie Nasr set the pace during the morning, with a lap of one minute 27.307, 0.056 seconds quicker than Red Bull's Daniel Ricciardo. McLaren-Honda, who had a troubled first test in Jerez, again hit problems, despite a promising start. Jenson Button completed 21 laps - nearly a third of the entire running the team managed at the first pre-season test earlier this month - and ended the morning sixth fastest, just 0.875 secs off the pace. Button had been second fastest to Ferrari's Kimi Raikkonen after two and a half hours. However, his running was then brought to an end after Honda discovered a faulty seal on the motor-generator unit recovering energy from the rear axle. Honda said it would need to redesign the component to prevent the problem recurring and that the new part would not be ready until Saturday. So although Fernando Alonso will have an engine for Friday, the same problem as affected Button may well recur then. All the teams confirmed for entry in this year's championship are in Barcelona. Force India - for whom Mercedes' Wehrlein had been invited to drive for the two days of testing - are running a 2014 car. Force India race driver Sergio Perez will take over the car for the afternoon, although they were awaiting final confirmation. The team's 2015 car is not ready to take part in this test, but they say it will be completed in time to run in at least some of the final test next week. Marussia failed to take part in the last three races of 2014 after collapsing with financial problems, but are still planning to come out of administration in the near future.